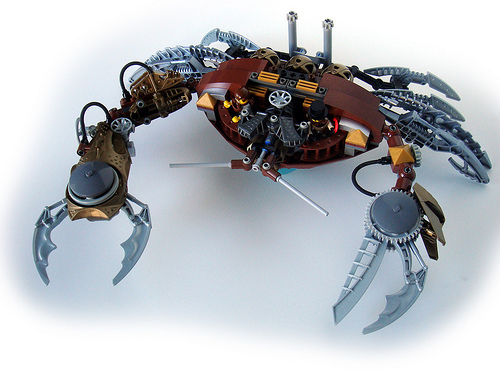 V&A Steamworks just posted a terrifyingly awesome Steampunk Crab. It has no name, as yet, but they are asking for suggestions. Go check it and drop off a few. Reminds me of the steampunk tarantula in Wild Wild West with Will Smith! It was flippin awesome! that’s quite nifty, two different claws.. Howzabout the name “Echinocephal” ? That’s one of the best uses of Bionicle parts I’ve seen. V. nice!